This weekend, I decided to stay local and head to two nearby towns. On Saturday, I took the train with Emile, my friend from France, to Merida. Merida used to be an important nucleus when Spain was under the rule of the Roman Empire. It was one of the two Roman administrative centers until it (as the rest of Spain) fell under Visigoth rule. I basically felt like I was in a Roman city. 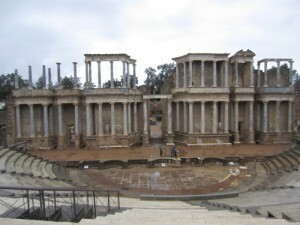 There are so many theaters, temples, houses, aqueducts and other Roman artifacts! Once we reached the tourist office, I was able to get information in English, but as usual, there wasn't any in French for Emile. We decided to first head to the main attractions in Merida - the Roman Theatre and Amphitheatre. It was sprinkling slightly, but luckily we didn't need to open our umbrellas. First was the Amphitheatre, which used house gladiators and animal shows. Again, it was exciting to imagine what it must have been like back in the day, when people would fill the stands and cheer on the gladiators. We could also walk around the pits and the rooms where they kept the animals and where the people prepared. Next was the Roman Theatre. As we were walking into it, it began to pour. POUR. Because the Roman theatre had been excavated and therefore used to be underground, it started to flood a bit. My boots were caked with mud. Anyways, the theatre looked very grand because there were many marble pillars still standing! There were also Roman statues, a garden in the back and an old Roman house. This site was also used for royal processions, city meetings and other important events. Because it was still raining, we decided to go to the National Museum of Roman Art next just be somewhere dry. This museum housed artifacts from Roman times, with everything from statues, rugs, glassware, jewelry and much more. It was interesting reading about everything. By this time, we were both super hungry and walked around trying to find a good place to eat. Vegetarian options for me are always pretty much the same so it didn't matter to me very much where we ended up going. We then headed to the Roman racetrack, or Circus, where there used to be chariot races. It was a pretty quick tour because essentially, it was just a big field. 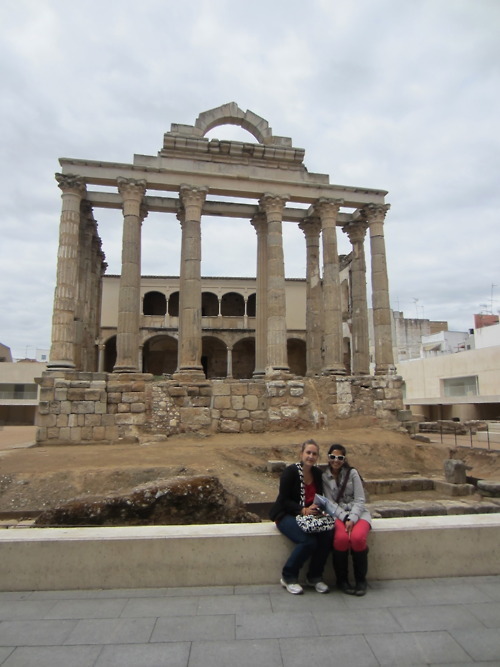 Afterwards we stopped at the Roman baths across the street before heading to the Basilica of Santa Eulalia. Santa Eulalia is the patron saint of the city because she was a 12-year-old who was killed for standing up for Christianity. What is awesome about this Basilica is that they let you go into the crypt underneath! If you didn't know, churches in Europe always have a crypt underneath where they keep the tombs of prominent people of the city and church. Usually, you are not allowed to go into them but in this case, it was an archeological site. It was so creepy and awesome at the same time. The reason they excavated this crypt is because there is part of a Roman house, art from both the Visigoth and Byzantine times, as well as an old church (underneath the current one!). After the crypt we went to the Temple of Diana (incorrectly named because it was later discovered to be a commemoration to the Emperor) which was one of my favorites. Basically, the Romans built a temple which served as the center of the city, and when the Visigoth Christians took over, it was fashionable to turn temples into luxury homes. So currently, the front is still a temple while the back is a crumbling old home. We were pretty tired from walking around everywhere, so a coffee sounded great at the time. We headed into this cute looking cafe and the menu had many different types of coffee items! Emile orders an expresso everytime but I wanted something a bit more sweet so I decided to order a mocha drink with whipped cream. However, I must have said something different when ordering because I ended up getting an interesting looking concoction that turned out to be extremely difficult to drink. It was a layer of condensed milk at the bottom, followed by a layer of expresso, with a GIGANTIC layer of whipped cream overflowing out of the cup. i basically had to eat my way through the whipped cream to get to the coffee. It was messy. We then started walking towards the river to view the Roman Bridge and the Aqueducts, taking the long way there just because we had time. The Roman bridge was unimpressive (I've seen too many at this point) but the Aqueducts were awesome! They were huge and had a bunch of stork nests. Storks are very very common here in Extremadura! I really want to see what the babies look like but apparently it's too early. They make a very interesting clicking noise as well. By now it was 18:30, so we headed towards the train station catch the 19:30 train back to Caceres. 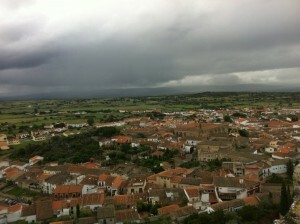 The next day, it took 45 minutes by bus to get to Trujillo. I walked to the Plaza Mayor, which turned out to be one of the largest I've seen so far. There was a giant statue of the discoverer Francisco Pizzaro in the middle (surprisingly a gift from an American Sculptor). As always, it was surrounded by a bunch of cafes and shops. There were placards on random historical buildings so I spent time reading them. I then went to the tourist office and purchased this pass which included admission to all of the big sites as well as a guided tour. The tour was in Spanish, but I decided to give it a try. It didn't start until eleven, so I went to some of the other places not covered on the tour. First was San Martin's Church, which was right on the plaza. It was nothing spectacular, but well known because it was at this church that Emperor Carlos V prayed before leaving to marry Isabel of Portugal. Basically it is famous because royalty visited. 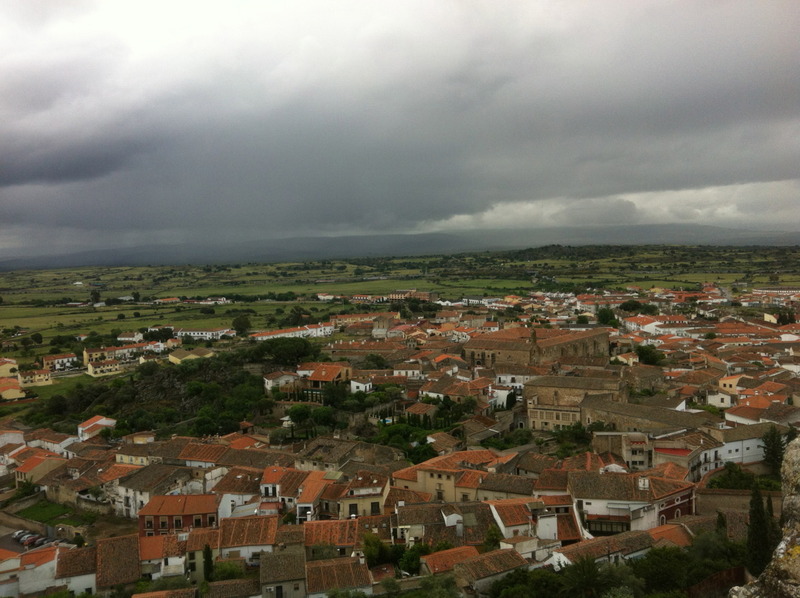 Next was a small torre- or tower -that had a history of Trujillo from Prehistoric to current times. As with every other city, it had similar roots: Roman, Visigoth, Muslim and finally Catholic Monarchs. I then met the tour group at eleven. I could barely understand the guide at all! I used my English pamphlet to supplement what he was saying but most of it just went in one ear and out the other. First, he told us about the different palaces in the corners of the main plaza which belonged to all the rich families. We then headed to one of the small palaces to admire the cloister. The highlight of my Trujillo trip was the castle. A great view of the city, plus the fact that I was so high up, meant that I could look inside the stork's nests-and guess what?! - There were small fluffy pure white babies! I was so excited to see them. I hope they start attempting to fly in the next week so I can watch them. In the end, I was glad I decided to visit local places instead of taking another weekend getaway because it allowed me to better understand Extramedura, the "state" that I am currently living in.